by Stuart K. Card, Jock D. Mackinlay, and Ben Shneiderman. You can order this book from the publisher or buy it from Amazon.com. This groundbreaking book defines the emerging field of information visualization and offers the first-ever collection of 47 classic papers of the discipline, with introductions and analytical discussions of each topic and paper. 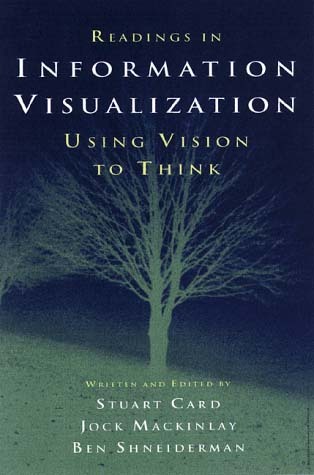 The authors' intention is to present papers that focus on the use of visualization to discover relationships, using interactive graphics to amplify thought. This book is intended for research professionals in academia and industry; new graduate students and professors who want to begin work in this burgeoning field; professionals involved in financial data analysis, statistics, and information design; scientific data managers; and professionals involved in medical, bioinformatics, and other areas. Stuart K. Card is a Xerox Research Fellow and manager of the User Interface Research Group at Xerox PARC. He received his A.B. in physics from Oberlin College in 1966 and his Ph.D. in psychology from Carnegie- Mellon University in 1978, where he pursued an interdisciplinary program in psychology, artificial intelligence, and computer science. Jock D. Mackinlay is a member of the User Interface Research Group at Xerox PARC, where he has been developing 3D user interfaces for information access for the last eight years. He received a Ph.D. in computer science from Stanford University and is a member of the editorial board of ACM Transactions on Computer Human Interaction. Ben Shneiderman is a professor in the Department of Computer Science, head of the Human-Computer Interaction Laboratory, and member of the Institute for Systems Research at the University of Maryland, College Park. He is the author and coauthor of many books, technical papers, and textbooks. Published January 1999, 686 pages.